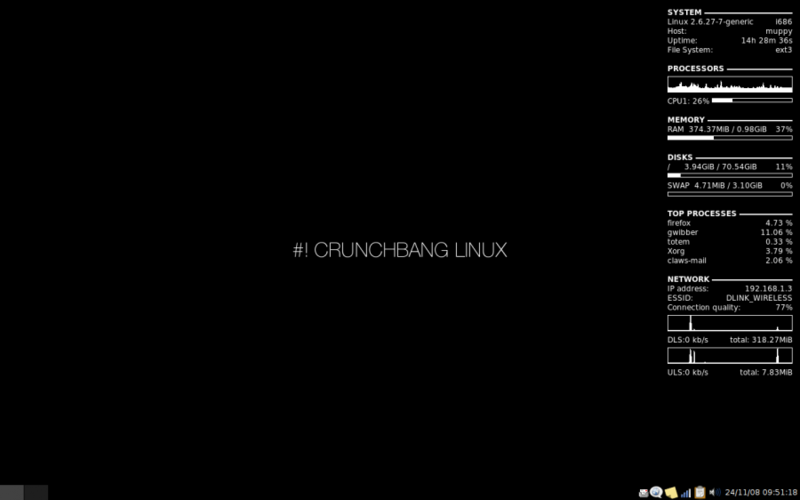 Crunch Bang Linux: Desktop Minimalism low on resources. This is just one more Linux distro I would toss out a recommendation for, but only for people with moderate Linux experience. In a technical sense it may slightly edge out MEPIS in performance and it is also a great "Out of the Box" OS for running Wifi and having PlashPlayer for YouTube preinstalled. It does not come with a word processor, but it has pre-made scripts you select to grab AbiWord or Libre Office. Also, it comes with the Iceweasel web browser but has similar scripts to make it easy to grab Chromium or Opera. In the same spot is a menu selection to change your default web browser. Now for the major difference which is the desktop where Crunch Bang goes in the opposite direction of MEPIS. While MEPIS offers the nice KDE Windows manager, Crunch Bang uses the barren minimalist OpenBox Window Manager. There is no task bar or start button. It does not even allow for desktop Icons unless you change setting or install a different File Manager. If you're a person who loathes seeing cluttered desktops this might appeal to you. On the other hand I think it might freakout typical Windows users who will be used to going for their Start Button. Oddly enough, Crunch Bang's desktop is faster to navigate IMO. It has a display on the desktop called Conky that lists memory and CPU stats and also Hot-Keys for bringing up the standard applications like the WebBrowser, Terminal, or File Browser. Otherwise, there is a menu you can access by right clicking anywhere on the desktop. Aside from that, if you think the default look is to blah you can tweak the window appears and still slap on a wallpaper. I still like MEPIS for my Laptop. I'm 50/50 on it regarding my Netbook because Crunch Bang's OpenBox naturally uses the least amount of screen real estate. I am using Crunch Bang on an old Desktop to save on resources while running Virtual Machines. I guess I'd wrap up by saying that Ubuntu and MINT seem to be the most well known or visible alternative Linux OSes, but I think both of these Debian Stable based Linux systems are definitely worth a look. I do think distros following Debian should be more thoroughly tested.